ProDen Plaque Off is a new innovation in oral care containing specially selected seaweed which is harvested from the seas of Norway and Iceland. It contains 12 vitamins, 13 minerals & trace elements and is rich in natural iodine. Used daily it can significantly help in the control of dental plaque, tartar and bad breath and is suitable for use with dogs and cats. A 60g pot can last for 6-12 months with daily use. Simply sprinkle the dried granules over your pets food daily and let PlaqueOff do the rest. I don't know if this works as we had to stop using it - it upset our dog's stomach. Tried it twice, initially at recommended rate and then a few weeks later at half rate and the results were the same, sloppy porridge coloured poo. It's a real shame as Henry wont let us brush his teeth and we had high hopes. This stuff is okay, our dog isn't too impressed with smell and taste. It does work, but not as much as one might think - this works best as an addition to a regular dental hygiene routine. We brush our dogs teeth 2-3 times a week and this seems to be helping a bit. Used this product for a few months and has definitely reduced plaque on my 2 dogs teeth. I was a bit dubious about if this would work. I have been putting it in my 5 dogs food since Feb 2017 and it has removed the tartar from their teeth and improved their breaths 100%. They also have the occasional raw bone which has helped clear off the tartar once the product has softened it. I'm really please with this product and that it is natural as well. Wish I had taken before photos so I could show you the difference!! I clean my cavaliers' teeth twice a week. At age 8 they have great clean teeth that impresses the vet! Have used Plaque off for years but then stopped using it for a few months. It then got harder to keep the teeth quite as clean. So I am back to using it. Somehow the plaqueoff makes it easy to brush off any plaque etc. Seems to loosen it. A great product. My little poodle x has had numerous dentals to keep his mouth healthy and I was very sceptical of any product but so wanted to avoid anaesthetic even though he is very fit so gave Plaque Off a try. Have to say 4 weeks in the tarter on his teeth is soft and so much easier to brush off. I have seen fabulous results that I really didn't expect. We have used this product for well over two years now. It came highly recommended from a friend, and I honestly say it works a treat. One of our rescue springers had dreadful tartar and plaque and within 6 months that was completely clear. Don't expect it to work over night. You have to use it for a long period of time before you see the improvement. I have been recommending it to all my friends. Absolutely no effect after 7 weeks. Too good to be true. I have been using this for both my dogs and have been really happy with the effect it has had, both have a noticable improvement in the look of their teeth. My youngest, Mitch especially. I bought this product because his teeth were looking brown and our vet noted he had the potential for problems in the future. I will continue to use this regularly. You don't need much so a small pot will last for several weeks. This is an amazing product! I used it on my dogs for years and then during a few years of chronic illness, I stopped giving it to them. I was then told by my vet that my eldest dog who is 9 would have to have teeth taken out. They weren't infected or troubling her and I didn't want to put her through an operation at her age but the fact that her teeth were not in good nick did upset me. I immediately started to use this product again and 6 months later I really can see the difference. You only need to use a tiny amount on the food and this tub has lasted me 6 months for 3 mini schnauzers. Its much cheaper and kinder than putting your dog through an operation ! Absolutely delighted! My dogs eat very healthily indeed but at age 2.5, 3.5 and 4yrs their teeth were starting to need attention. I was concerned about the high salt and sugar content of daily dental chews and wanted a healthier alternative that would clean their teeth without the junkfood - this is it! It's fantastic stuff. For all the doubters, I actually tried Plaque off for about 6 weeks over a year ago and wasn't impressed; I gave up too soon and went back to using a well known brand of dental chews. Recently I was convinced by a friend to give it another go. I'm SO glad I did! It is just brilliant. My vet has commented on how 'pearly white' my dogs' teeth are. The bad breath that two of my three dogs were suffering from has gone. They are perfectly happy to have plaque off added to their food. Am now buying a huge tub as I have such faith in this stuff. I'm also buying the human tablets for myself - hopefully my teeth will soon look as good as the dogs! We have an eldery Greyhound who recently had 11 teeth extracted so we started using Plaque off about 2 months ago. It is remarkable the difference it has made to his remaining teeth and the ease off removing any build up when you brush. Brilliant product. surprisingly effective on my cats. They are aware of it on the food( dry) but i have noticed a definite improvement in all of their teeth. service & delivery are second to none, thankyou. My 3 year old cat Sylvie was beginning to get yellowing of her back teeth despite my efforts at cleaning them. I changed to Proden in February (4 months ago)and she now has a full mouth of snow white teeth again. When I first opened the pot and smelled the mixture I was sure she wouldn't touch it - wrong! After a careful sniff she tucked in and we've never looked back. In 4 months I've used just over half a jar. Initially I used almost a whole spoon, but now used only about a third. I will continue to try and use as little as possible to maintain her pearly whites. Thank goodness I found this mixture - the toothbrush regime was torture! Was recommended this by our dog trainers about 2 years ago. Seemed expensive for such a small pot, but at just under 10kg, a pot lasts about 6 months, so it's not that expensive, especially as his teeth look in such good condition now. Will definitely continue to use this. Both my cats had dental problems when they were 3 years old and had to have veterinary treatment. I wanted to do as much as possible to keep their teeth healthy and read good reviews about this item. I purchase other products for them from this website and was very pleased to find it here at a better price than other places. They each have half a scoop mixed in with their breakfast every day and don't notice it at all. It is very economical, a small tub lasts for several months. Their teeth have been in good condition whenever the vet has checked since. Thanks VetUK! We have given this to our dog ever since he was about a year old. He is now 6 years old and has shown no sign off plaque or teeth decay. Excellent product. This was recommended to me by my vet to help prevent build up, I was optimistic as my JRT is a fussy eater. Happily still clears her bowl and in combination with regular teeth cleaning her teeth are near perfect. Excellent and lasts for ages. This is BRILLIANT! I have used it on my cat and dog for about 6 weeks now and the difference in their teeth is amazing. The cats teeth were creamy yellow with plaque build up, but I was reluctant to put her under anaesthetic at the vets to have the plaque removed - now I don't have to! The plaque has just brushed off and her teeth are getting whiter by the day. The dogs teeth weren't that bad, just some discolouration around the gums, but this has gone completely. Definitely recommend. After all the good reviews I expected this to help our dogs - but 2 months on the higher dose has done NOTHING at all for my Cavaliers' teeth. Very disappointed - total waste of money. Fantastic product. I have three rescue greyhounds and a Spanish sheepdog, and after two months using this product their teeth are much improved. I am now going to have this product sent to Spain. Our 2 King Charkes Spaniels both have plaque problems and the vet wanted to clean them under anesetic - but as usual with this breed they have a heart murmour so I wanted to try something else first. Read the reviews - thought well it couldn't hurt- and boy am I surprised... Their teeth are not yet brilliant white, but they are no longer brown - and seem to get better each week. I do brush them as well - they seem to like the toothpaste so that helps... Back for more and thinking about the adult one too... They don;t seem to mind the taste they have dry food monday to friday and wet food with mixer at the weekend all witht he recommneded scoop!! Super product. One of our dogs had a bad build up of plaque on her teeth and we were just about to book her an appointment at the vet to have it removed when we heard of this product through a dog magazine. We weren't too convinced about how well it would work but having read the reviews, thought we should give it a try. After just 10 weeks, we easily removed much of the plaque build up ourselves (gently). It was quite soft and easily removed. All of our dogs are happy for us to mess about with their teeth which helps. We have also noticed our other dogs teeth are whiter and the smaller build up of plaque is coming off with regular cleaning. Would definitely recommend it. This was recommended to us by a friend whose Cocker Spaniel used to have yellow teeth. They are now white and clean. Thanks to her diet, despite having the typical narrow jaw of her breed, my Greyhound has very good teeth. However, because of her narrow jaws, the upper canines don't get cleaned by gnawing on bones and rawhide chews. She therefore had plaque on her upper canines and hated us trying to clean it off. We tried a spray (which was supposed to work in the same way as the Plaque Off), but she hated us spraying it into her mouth. With the Plaque-Off, we put it into her cod liver oil and she takes it readily, although she was initially wary. After a month of (nearly) daily use, one canine is completely free of tartar and the worse canine is much improved - I am sure this one will soon be free of tartar too. Definitely worth getting as dental problems can lead to all sorts of health problems with the heart and other internal organs. For the past 7 years we have visited the vets to have our Westie's teeth cleaned. Not cheap and not good for the dog being drugged for the cleaning. We found out about Proden and it really works. The build up of tartar has gone and his teeth are clean and white. Highly recommended. I've been using this on my dog for just over a month now. Last visit to the vet he suggested my dog may have to have the plaque removed at the surgery since he hates having his teeth brushed despite my best efforts! I'm absolutely amazed at the effect this product has had already. My dog's front teeth really are white and his back ones(the worse affected) are getting there, nowhere near as bad as they were. If you're not sure whether it will work for your dog, I would certainly recommend giving it a try, especially if like me, brushing the teeth is a major struggle. I'm glad I put my doubts aside and gave it a go. I've been using PlaqueOff for about 6 months now. I have 2 rescue greyhounds, both who came to me having had their teeth cleaned by the vet. Greyhounds generally have bad teeth due to their terrible diet (shameful) and once the vet has scraped them clean the teeth are susceptible to more plaque because the scraping causes the surface of the teeth to be rough - hence the tartar clings easily. From then on it's very important to keep the teeth clean. Mine hated the toothbrush routine and i soon tired of the struggle. So I overcame my scepticism and gave this a try. The elder of my hounds already had some worrying hard tartar on the back teeth. I didn't expect this to get shifted, rather for the softer plaque to be retarded or removed. I was very very surprised. It took a while, more than the weeks the instructions intimate, but after about 3 months the hard tartar was beginning to disappear. My fears that my girl was heading for another anaesthetic and a dental are now gone - the plaque is indeed "off" as is most of the hard tartar. I consider this product a little miracle in tub. It didn't take them long to get used to it (a few miffed sniffs at first) and it's easy to hide in their food. My hats off to Proden for this amazing product. Am considering taking the human version myself it's so effective. Highly recommended! These product do work. The effect is not amazing, but the smell of breath is much more better and accumulation of plaque is decreased. I Have been using this on my Cavaliers for 2 years now & my two moggie cats. Cavaliers are especially prone to dental problems. When I first saw this product at the Vet surgery, I considered it to be another way to extract money from you - as sceptical as I am about vet surgeries! I had decided that I wasn't going to get sucked in by it all. But after another year passed and regularly cleaning my dogs teeth, and not seeing much improvement, I kind of thought about it... then bought some! Within weeks there was improvement with my dogs teeth & bad breath became a thing of the past! Their teeth were greatly improved, and of course there has got to be other health benefits owing to the natural ingredients. Of course I still regularly check my pets teeth, but this stuff does wonders, it can save you a lot of money or worry if your pet has to go under anaesthetic for their teeth. Nothing is 100 per cent, but you wont be disappointed - it is a first class product! Fantastic stuff. My two Springers now have 'pearly white' teeth. To have the Vet de-scaling the dogs would have cost £150 each for it merely to have returned again and again. This product is great. I rescued my dog who had horrendous teeth probably at the worst stage of decay with green plaque on his teeth and inflamed gums. i brought this product a month ago and my dogs teeth have no plaque/decay on them at all now, they are still inflamed but I guess with time they will heal. after 3 weeks i was looking at them and i literally scratched the tooth and the plaque came off! I was amazed some spots are tough to get off but i totally recommend this product. his breath has improved as well but that was never really an issue. it apparently works by as the product enters the blood stream it changes the saliva which then is able to dissolve tartar, allowing the tartar to crumble away. It also prevents new layers of plaque and tartar from getting on the teeth. The changed saliva can help to get rid of the bacteria that help the formation of plaque and tartar. this is worth it and takes the hassle out of trying to brush a dogs teeth. and luckily my dogs a westie and only requires half to a whole spoon of the product. the spoon is tiny like a cm wide maybe smaller! so the small tub of plaque off will last me a while. Don't be tempted to put more on for quicker results the amount stated for the weight of the dog will work!! hope this helps. Bought "plaque off" several months ago for my 18 month dog, within a few weeks the difference on her teeth and breathe was amazing, her teeth are lovely and clean and breathe is very fresh, had her at Vet today for yearly boosters and even the vet commented on how good her teeth were looking. 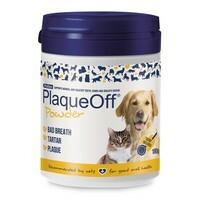 Going to buy the "plaque off" for humans and give it a try. I bought this as the last resort, some of my dogs teeth were black, and her breath was foul. I knew if I took her to the vets, it would be uncomfortable, and not the mention the cost. Tried this and the results are fantastic! I could actually tell it was working after a few days. Definitely worth a go!!! Have used this for our cat for about 10 months now (have you ever tried to clean a cat's teeth?? - Ouch!!) We're only just getting to the end of the small pot, so it's lasted v well. And most importantly, he doesn't have smelly breath any more, and the vet has been more than happy with his teeth on all his visits! I have been using this product for over a year now. My dog had a build up of tartar on his teeth and this has cleared it up. I would definitely recommend this product and you don't have to use any nasty toothbrushes either! I bought this product from my local pet shop and I have to say I`m very impressed with it. I can recommend it. Very impressed with this product. It has cleaned our 9 year dogs' teeth beautifully, and she no longer requires dental treatment at the vet, thank goodness. Best product yet, and I will continue to use it, happy dog and happy owner!! Our dogs teeth remain clean, with the added bonus of fresher breath when using Plaque Off. None of our eight dogs notice it sprinkled in their food which is good. I've been using this product for about 3.5years. I originally purchased it as my elderly collie had dreadful breath - it certainly cured that. My current old girl (15.5years) also has sweet breath - she does have quite a bit of tartar, but she was not put on the product until she was 12, and I haven't attempted to clean the teeth at all since. My GSD has had it since she was about 1 yr old. Each time we go to the vet for a check up he comments on how clean her teeth are - there is virtually no tartar at all. With the best will in the world I am never going to clean my dogs' teeth , so I would strongly recommend this product. It may seem pricey, but it does last a very long time. I thought I would try this rather than worry about dental casts at the vet, sadly it was a waste of money. I have two dogs on it and they have been for some time ( I am on my 2nd tub!) So I have given it plenty of time. IT DOES NOT WORK, ask my vet who has landed me with a £230 bill to clean the dogs teeth today!! I won't be ordering any more!! I must admit I was sceptical about this product. However, I am pleased to report that the results have been superb. I have a 10 year old Golden Retriever who has never had a great deal of plaque on her teeth (I have always cleaned them from day one) but as she became older I found that her gums appeared to be getting sensitive to brushing with even a soft brush. This product has solved the problem. Highly recommended. Thank you. We have one dog who used to have really bad breath and since using this product for the last 8 months we wouldn't go past it what a difference. I have four dogs and this really works on their teeth, even the vet comments on how clean their teeth are. It is never too early or late to start using it. Definitely recommend to anyone better than high vet bills for teeth descaling. Better for the dogs as well. I have four dogs aged three, eleven, twelve and fourteen years. Plaque off has worked wonders on their teeth, even the fourteen-year old's are a lot better. The other three's teeth look like they did as puppies. I am delighted with this product and wouldn't hesitate to recommend it.